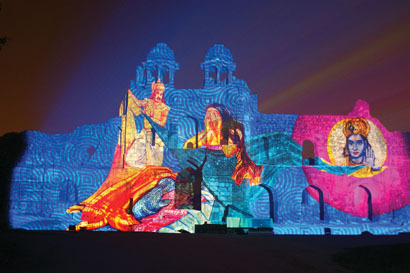 DELHI, India – India's Tourism Development Corporation, a government-run entity, commissioned a permanent 40-minute son et lumière from Ross Ashton's U.K.-based company, The Projection Studio, at Purana Qila, a fort founded by the second Mughal Emperor, Humayun in 1533. For the resulting large-format projection, ISHQ-e-DILLI, or The Love of Delhi, Ashton and crew created the content and handled the technical, design and installation details, collaborating closely with creative director and initiator Himanshu Sabharwal of Delhi-based Two's A Film Company. Ashton specified the Christie 20K video projectors for the project, with imagery controlled by a Dataton Watchout system. The three projectors are housed in custom hides and create a 50-by-20-meter image, with the visuals adjusted to for the uneven projection surface. "I specified the Christies because I know from experience that they are bright and rugged enough to deal with the tough environment, operating conditions and the schedule of nightly shows," said Ashton. The Watchout system was also chosen for its reliability and familiarity to the technicians who are maintaining the installation day-to-day. The Humayun Gate at the south of the Fort serves as a backdrop as the story unfolds, recounting the history of Delhi, dating from the time of the Pandavas to post-independence India. "It's always good to be involved with creating something new and special, particularly when it involves a historically significant building," Ashton said. For more information, please visit www.projecting.co.uk.